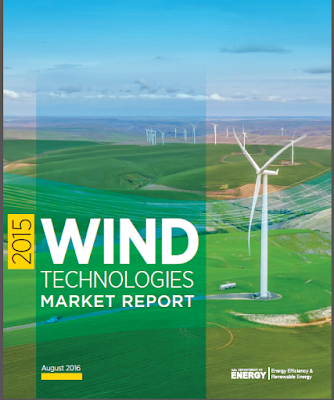 A new report, "2015 Wind Technologies Market Report" from DoE, primary authors Riser and Bollinger, gives the present state of the US wind power industry. see link The Executive Summary is below. o Installed cost in the windy Great Plains is $1,640 / kW, continuing the downward trend of the past several years. o Also, wind power is sold at very low prices under a Purchase Power Agreement, for $20 / MWh. The federal tax credit continues at $23 per MWh. o Finally, capacity factors for 2015 are higher than ever, at 41.2 percent among projects built in 2014. Annual wind power capacity additions in the United States surged in 2015 and are projected to continue at a rapid clip in the coming five years. Recent and projected near-term growth is supported by the industry’s primary federal incentive—the production tax credit (PTC)—as well as a myriad of state-level policies. Wind additions are also being driven by improvements in the cost and performance of wind power technologies, yielding low power sales prices for utility, corporate, and other purchasers. At the same time, the prospects for growth beyond the current PTC cycle remain uncertain: growth could be blunted by declining federal tax support, expectations for low natural gas prices, and modest electricity demand growth. drivers, cumulative wind power capacity grew by 12%, bringing the total to 73,992 MW. 2015, up sharply from its 24% market share the year before and close to its all-time high. smaller in the West (22%) and Northeast (21%), and considerably less in the Southeast (2%). to 5.6% of electricity demand. states in 2015. On a cumulative basis, Texas remained the clear leader, with 17,711 MW. experienced setbacks. Strides continued to be made in the federal arena in 2015, both through the U.S. Department of the Interior’s responsibilities in issuing offshore leases, and the U.S.Department of Energy’s (DOE’s) funding for demonstration projects. A total of 23 offshore wind projects totaling more than 16 GW are in various stages of development in the United States. gas and 24 GW of solar. recent dominance as the three largest turbine suppliers to the U.S., in 2015 GE captured 40% of the market, followed by Vestas (33%) and Siemens (14%). Globally, Goldwind and Vestas were the top two suppliers, followed by GE, Siemens, and Gamesa. Chinese manufacturers continued to occupy positions of prominence in the global ratings, with five of the top 10 spots; to date, however, their growth has been based almost entirely on sales in China. for significant supply-chain expansion have become more pessimistic. blades and hubs (50-70%), but is much lower (less than 20%) for most components internal to the nacelle. Exports of wind-powered generating sets from the United States rose from $16 million in 2007 to $544 million in 2014, but fell to $149 million in 2015.
another busy year, given the recent 5-year PTC extension and phase down. States, with merchant/quasi-merchant projects accounting for 24%, power marketers 6%, and direct retail buyers just 2% (though likely to increase in the coming years). diameter was 102 meters, up 113% since 1998–1999. recent years. Rotor scaling has been especially significant in recent years, and more so than increases in nameplate capacity and hub heights, both of which have seen a stabilization of the long-term trend since at least 2011. In 2008, no turbines employed rotors that were 100 meters in diameter or larger; by 2015, 86% of new installed wind capacity featured rotor diameters of at least 100 meters. capacity, there has been a decline in the average “specific power” i (in W/m2) over time, from 394 W/m2 among projects installed in 1998–1999 to 246 W/m2 among projects installed in 2015. In general, turbines with low specific power were originally designed for lower wind speed sites. Another indication of the increasing prevalence of lower wind speed turbines is that, in 2015, the vast majority of new installations used IEC Class 3 and Class 2/3 turbines. i A wind turbine’s specific power is the ratio of its nameplate capacity rating to its rotor-swept area. All else equal, a decline in specific power should lead to an increase in capacity factor. employed in all regions of the United States, and in both lower and higher wind speed sites. decisions likely driven by the wind shear of the site. 2010 versus 30.3% between 2000 and 2005. That being said, time-varying influences—such as inter-year variations in the strength of the wind resource or changes in the amount of wind energy curtailment—have partially masked the positive influence of turbine scaling on capacity factors. For example, wind speeds throughout the interior and western U.S. were significantly below normal for much of 2015, which negatively impacted fleet-wide capacity factors. Positively, the degree of wind curtailment has declined recently in what historically have been the most problematic areas. For example, only 1.0% of all wind generation within ERCOT was curtailed in 2015, down sharply from the peak of 17% in 2009.
significantly higher over time among projects located within given wind resource regimes. particularly as they approach and enter their second decade of operations. resource in each region, and they reflect the degree to which each region has adopted turbines with lower specific power or taller towers. For example, the Great Lakes has thus far adopted these new designs to a much larger extent than has the West, with corresponding implications for average capacity factors in each region. $1,500/kW by the end of 2008. Wind turbine prices have since dropped substantially, despite increases in hub heights and especially rotor diameters. Recently announced transactions feature pricing in the $850–$1,250/kW range. These price reductions, coupled with improved turbine technology, have exerted downward pressure on project costs and wind power prices. and anticipating completion in 2016 suggest no material change in installed costs in 2016.
was the lowest-cost region, with a capacity-weighted average cost of $1,640/kW. projects in their first several years of operation, and that O&M costs increase as projects age. generation extending out through 2040.
to a resurgent domestic market. In December 2015, Congress passed a 5-year phased-down extension of the PTC. To qualify, projects must begin construction before January 1, 2020. In May 2016, the IRS issued favorable guidance allowing four years for project completion after the start of construction, without the burden of having to prove continuous construction. In extending the PTC, Congress also included a progressive reduction in the value of the credit for projects starting construction after 2016. Specifically, the PTC will phase down in increments of 20 percentage points per year for projects starting construction in 2017 (80% PTC), 2018 (60%), and 2019 (40%). transmission investment. About 1,500 miles of transmission lines came on-line in 2015—less than in previous years. The wind industry, however, has identified 15 near-term transmission projects that—if all were completed—could carry 52 GW of additional wind capacity. With the five-year phased-down extension of the PTC, annual wind power capacity additions are projected to continue at a rapid clip for several years. Near-term additions will also be driven by improvements in the cost and performance of wind power technologies, which continue to yield very low power sales prices. Growing corporate demand for wind energy and state-level policies are expected to play important roles as well, as might utility action to proactively stay ahead of possible future environmental compliance obligations. As a result, various forecasts for the domestic market show expected capacity additions averaging more than 8,000 MW/year from 2016 to 2020. Projections for 2021 to 2023, however, show a downturn in additions as the PTC progressively delivers less value to the sector. as does burgeoning corporate demand for wind energy and longer-term state RPS requirements. EPA’s Clean Power Plan, depending on its ultimate fate, may also create new markets for wind. Moreover, new transmission in some regions is expected to open up high-quality wind resources to development. Given these diverse underlying potential trends, wind capacity additions— especially after 2020—remain uncertain.